We were impressed with how Virginia's Anderson's Neck Oyster Farm is positioning itself as an environmental enterprise. The website is terrific. Anderson's Neck Oyster Company announces that by March 9, 2014 the environmentally friendly small business will have filtered 20 billion gallons of water in the Chesapeake Bay through their oyster farm. 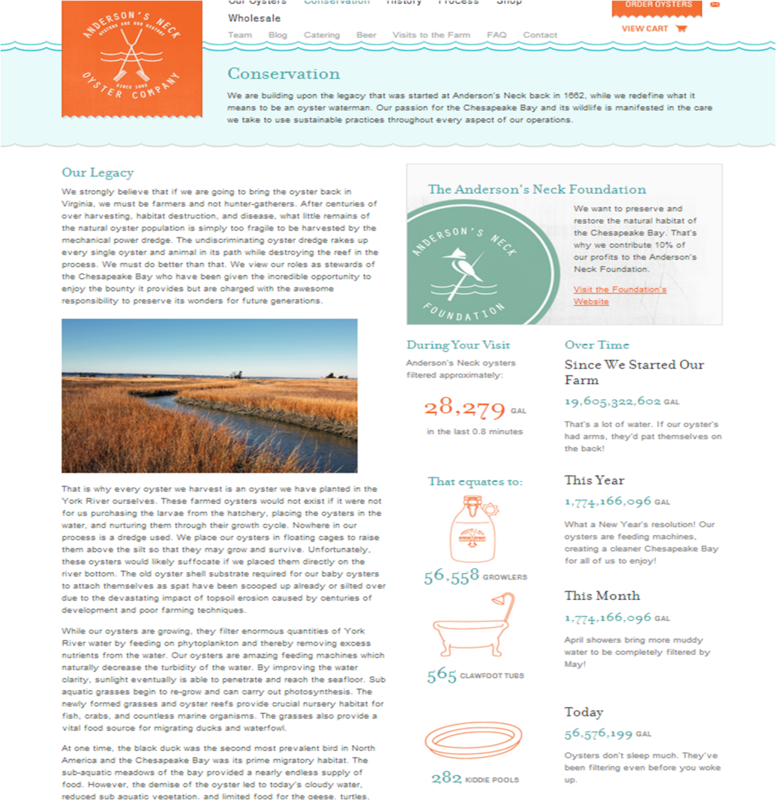 You can view the progress towards this goal online at http://www.andersonsneck.com/conservation/. Screenshot of Anderson's Neck Oyster Company's excellent web-page that quantifies the water filtered by their shellfish. By nourishing oyster seeds over time, Anderson's Neck has re-created oyster reefs in the form of a modern aquaculture farm, filtering the water in the Chesapeake Bay and the York River, where the oysters grow. Anderson's Neck founders Michael & Laura Hild said they started Anderson's Neck because, "The Chesapeake Bay is sick. It's not dead, but [it's] sick. And until you get oysters back in the water to filter it, the Chesapeake Bay will be sick forever." When English settlers arrived in the 1600s, the waters of the Chesapeake Bay were clear and clean and the bottom of the Bay was covered with oyster reefs. This created the ideal conditions for oysters to grow and flourish. According to estimates by biologists, when the first English settlers reached the Chesapeake Bay, oysters were filtering the entire Bay about once every four days. By the late 1900s, the low number of oysters remaining would take almost a year to complete that same process. Not only do oysters suffer in cloudy water, but the sea grasses, which provide food to ducks and shelter to keep predators away from fish and crabs, can't grow. Anderson's Neck Oyster Company is committed to recreating oyster beds and harvesting without the use of dredges which disturbs the bottom and destroys plant life. While the baby oyster seeds grow, they are placed in a protected nursery environment where solar-powered pumps continually push water up and over the oysters. Once the baby oysters graduate from the nursery, they are placed in a floating cage system that keeps the oysters out of the muck and on the top of the water column where the oyster's food source thrives. Here the cages are worked regularly and the oysters are brought to a large oyster tumbler that cleans the shellfish and helps them form a cuppy shell over time. The process for oysters to grow takes about 18 months, on average. Since Anderson's Neck began this process in 2010, 20 billion gallons of water will have cycled through their oysters. And with its latest oyster seed planning this year, Anderson's Neck will have placed in excess of 10 million oysters into the York River that would not otherwise be there. The Hild's recognize that the company's process takes more time and effort. "We're not trying to be the low-cost provider of oysters. We want to be the crème de la crème. But when people eat an Anderson's Neck oyster, they'll know that it was raised through our blood, sweat and tears using [environmentally friendly] practices right here on the York River." Anderson's Neck Oyster Company believes that it's not simply enough to responsibly farm oysters. In an effort to see the natural habitat of the Chesapeake Bay restored, Anderson's Neck has committed to contributing 10% of its profits to the protection and rehabilitation of the Chesapeake Bay habitat, both land and aquatic. Every Anderson's Neck oyster purchased and consumed means a contribution to the restoration of the Chesapeake Bay. Anderson's Neck Oyster Company is proud to bring oysters back to the Upper York River and Chesapeake Bay area. Our passion for the Bay is manifested in the care we take to use sustainable practices throughout every aspect of our operations. Anderson's Neck lies on a two-mile stretch of land along the York River within the land that was granted to Richard Anderson by the king of England in 1662, which covered about 300 acres.